Bar (or barre) chords often present a huge difficulty to beginner guitarists. Almost every student I have struggles to some extent when they are first learning to use bar chords in the songs they play. Even though it can be tough to get a grip on these types of chords, they are incredibly important to be able to do. I would guess that upwards of 50% of the songs out there require barring in some way or another. Having helped many students build a functional level of ability with bar chords over the years, I’ve seen first hand just how big a difference proper hand positioning can make with these types of chords. I often can tell, before a student even strums a bar chord, whether it is going to sound clear or just like a dull thud of muted or buzzing strings based off their hand position when holding down the chord. Success on bar chords takes much more than simply learning where the fingers should go. 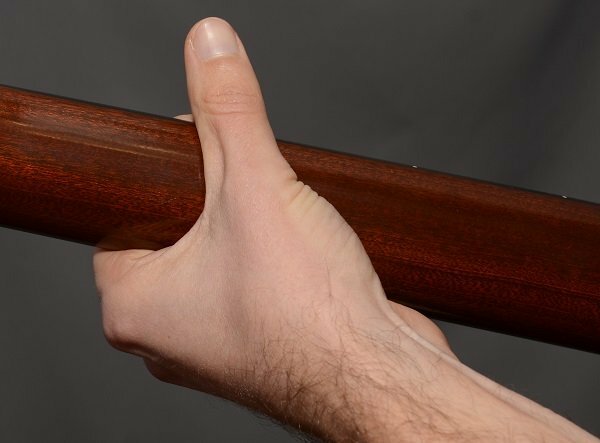 Getting optimal curvature of the fingers, placement of the thumb, and knowing the subtleties of positioning the finger that is doing the bar can make all the difference. In this article, I’m going to go through how to position your hands so as to get the leverage you need to get a nice, clear sound out of these chords when playing them. I’ll start by showing the proper thumb position when fretting a bar chord on the guitar. The thumb is the foundation on which everything else rests. 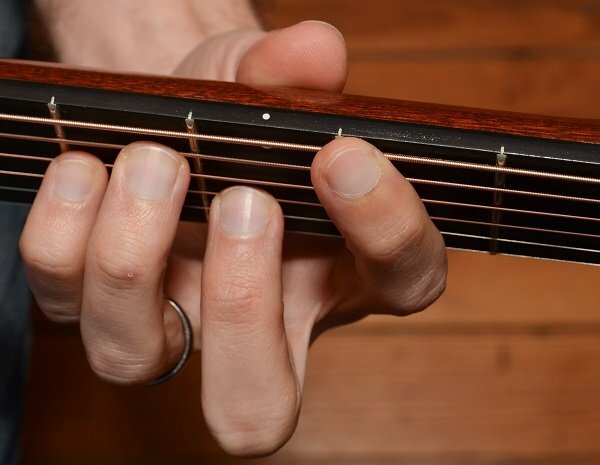 Having a good thumb position will enable you to get the leverage you need for pressing down hard enough on each string, as well as enabling you to spread your fingers out enough as you need to. Notice how my thumb is straight, pointing up, and is pressing in the middle of the neck of the guitar. 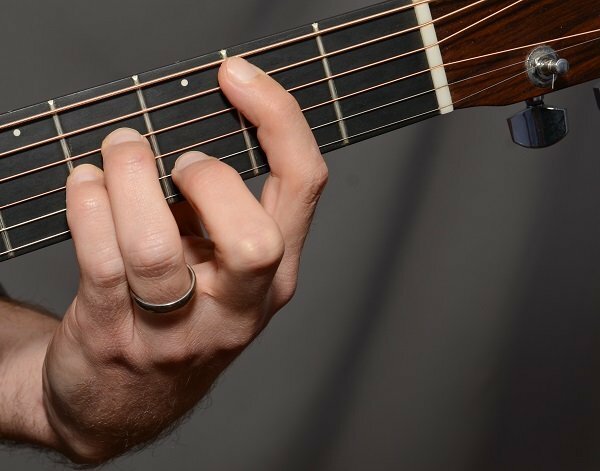 This is how you should have your thumb when fretting a bar chord. 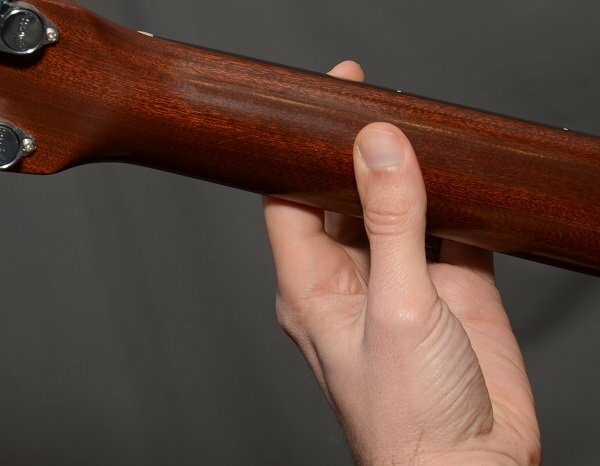 In both of these cases, you won’t be able to spread your fingers out enough or get enough pressure coming down on the strings in order to achieve the positioning described for the other fingers in this article. Notice how my thumb is opposite my 2nd (middle) finger on the other side of the neck. Having your thumb too far to the left or right will cause strain and tension in the rest of your hand, thus making it more of a struggle to fret the chord. See how my index finger actually isn’t completely flat. Since I only need to bear down on the 1st and 5th strings, I just make sure I have enough pressure on those strings while relaxing a little on the rest. Sure, I could keep my finger rigid and flat, but that would add more of a sense of strain and struggle when fretting this chord. Also notice how I’m coming down on the 1st string with the knuckle part of my finger. This is a hard part of the finger, which therefore makes it easier to get the pressure I need coming down on the 1st string. The position of the 1st finger bar is almost identical to that of the Bm chord. All aspects of it are the same except it is now barring across all six of the strings. The 1st and 2nd strings are both being fretted with the hard, knuckle part of the finger. The position of the 1st finger is slightly different for some other bar chords. Here are pictures of me doing an F#m chord on the left, an F#7 in the middle, and a B7 on the right. For all 3 of these chords, there are more notes that are being fretted with the barred 1st finger. As a result, I have to keep the finger much more straight and flattened out than I did on the Bm or F# chord. While I do have some bending in the lower joint in the 1st finger, the upper (distal) joint is completely flat. This is very important to ensure clarity from all the notes coming from the 1st finger. It actually is a more ergonomic position for the finger, which leads to less strain in the rest of the hand. The finger is a bit harder on it’s side, which makes it easier to get adequate pressure on the strings. 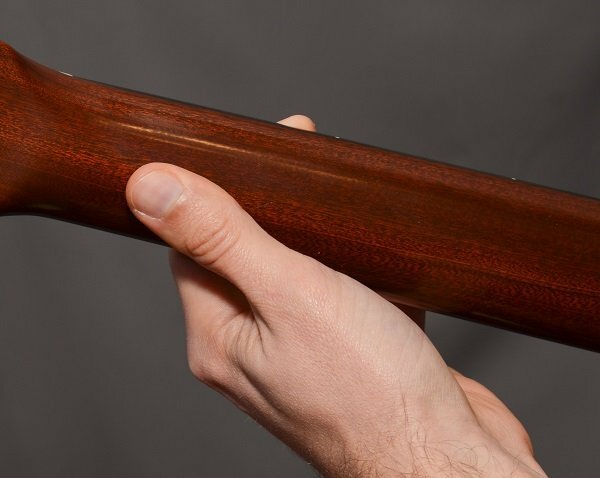 You would want to have your finger rolled slightly to the side like this for any bar chord that requires a bar with the 1st finger. Notice how the other fingers are fanned out. You can see my 2nd (middle) finger leaning ever so slightly to its left. The 3rd and 4th fingers are leaning toward their right. Having this symmetry to the hand helps ensure good leverage and adequate pressure coming down on the strings. Correct thumb placement is vital for this, since it enables the fingers to spread out enough to achieve this position. Notice how fingers 2, 3 and 4 are all curled around quite a bit. 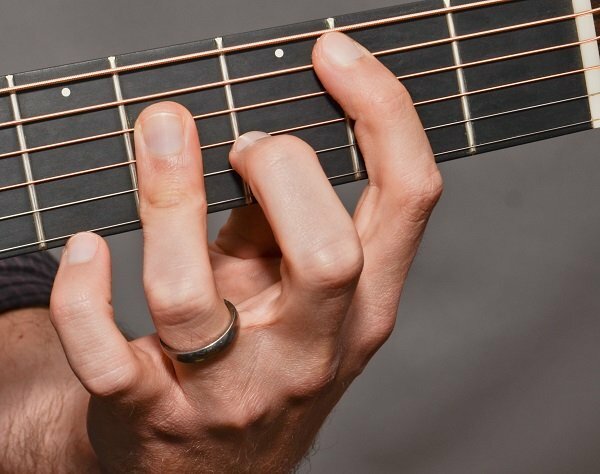 There is a lot of bend in both joints in the finger, which helps those fingers avoid touching other strings as well as easily getting good leverage on the strings they are supposed to be touching. 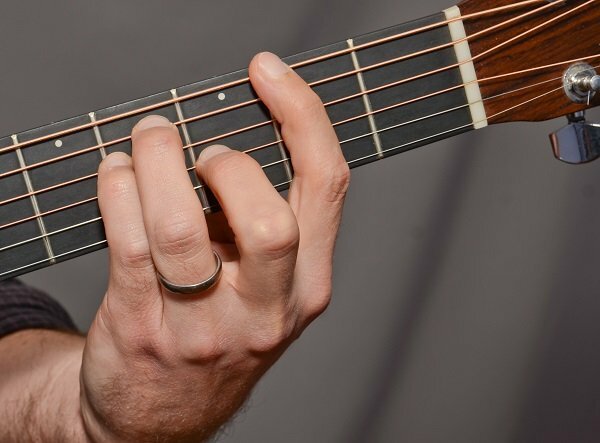 Some bar chords require barring with the 3rd/ring finger, particularly major bar chords that are rooted on the 5th string. 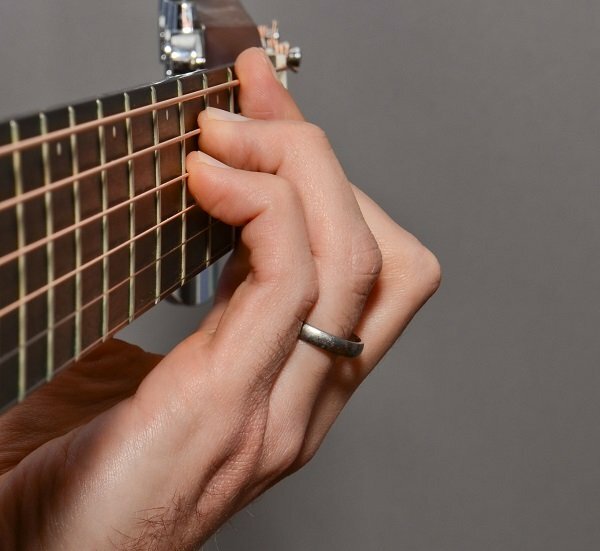 These chords can present a unique challenge to someone first trying to get the hang of them, since the 3rd finger tends to be weak and difficult to control. Placement of the 3rd finger within the fret is important. You want the segment of the finger that is laying flat to be close to, and running parallel to, the fret it is supposed to be behind. This minimizes the amount of pressure needed to produce clear notes. One other thing to notice in this finger is that the 1st finger doesn’t have to lay flat at all. Since it’s only needed to fret the bass note of the chord, it can be curved a little. Look at the bending in both joints in the 3rd finger. While the lower, larger joint is bent a little in the normal direction that joints bend, the upper (distal) joint is actually bent backwards a little. 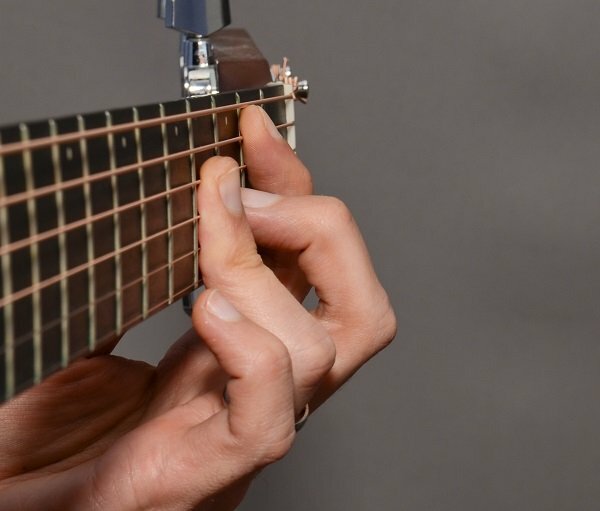 This position in the finger ensures that there is downward pressure on the strings, but that the pressure is distributed evenly across the 3 strings that are supposed to be held down. Posted in General Advice, Getting Started, Technique and tagged Bar Chords, Beginners, Chords, Intermediate, Technique.